Background: Minimally-invasive surgery is associated with a decreased activation of both systemic and peritoneal immunity as compared to the open (O) technique. However, the hepatic response to laparoscopic (L) and hand-assisted (HA) surgery has not been defined well. We postulated that both laparoscopic and hand-assisted approaches are associated with a diminished expression of hepatic pro-inflammatory transcription factors. Materials and Methods: Eighteen pigs underwent a transabdominal nephrectomy via O, HA or L approach. Liver samples were obtained 24 hours postoperatively and spot frozen. Frozen tissue samples were homogenized, and the nuclear pellets were separated. The nuclear membranes were then lysed and the nuclear extracts were analyzed to determine levels of 3 nuclear signaling phosphoproteins. Nuclear factor (NF)-kappaB, heat-shock protein (HSP)-27, and p38 mitogen-activated protein kinase (MAPK) were analyzed by a multiplex protein analysis system. Statistical comparison was performed using Student’s t-test. Results: The average expression of HSP-27 was not different between the L, HA, and O groups. The average expression of NF-kappaB was significantly higher in the O than either the L or the HA groups (21.3 vs 5.5 ru, p=0.032; 21.3 vs 7.8 ru, p=0.048, respectively). There was no difference between the L vs the HA groups. Similarly, the average expression of p38 MAPK was significantly higher in the O vs either the L or the HA groups (42.7 vs 22.5 ru, p=0.036; 42.7 vs 12.2 ru, p=0.007, respectively). There was no difference between the L and the HA groups. Conclusion: The stress of abdominal surgery results in the activation of hepatic signaling pathways. 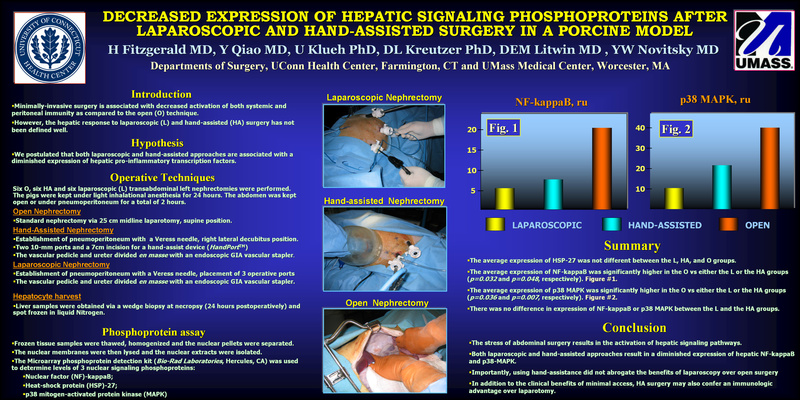 Both laparoscopic and hand-assisted approaches resulted in a diminished expression of hepatic NF-kappaB and p38-MAPK. Importantly, using hand-assistance did not abrogate the benefits of laparoscopy. In addition to the clinical benefits of minimal access, HA surgery may also confer an immunologic advantage over laparotomy.